Takeaway Lanzarote - Restaurants Puerto del Carmen Mozzarella, Potatoes, fresh Sausage and Rosemary. Italia Ristorante - Italian Takeaway Puerto del CarmenTakeaway Food Lanzarote.Delivery Available for Puerto del Carmen, Tias, Macher, Puerto CaleroFood Delivery Service - Lanzarote. Takeaway Lanzarote - Restaurants Puerto del Carmen Pizza Ortolana - Salad, cherry tomatoes, parmesan cheese and mozzarella. Italia Ristorante - Italian Takeaway Puerto del CarmenTakeaway Food Lanzarote.Delivery Available for Puerto del Carmen, Tias, Macher, Puerto CaleroFood Delivery Service - Lanzarote. Takeaway Lanzarote - Restaurants Puerto del Carmen Tomato, tuna, Onion, Mozzarella Italia Ristorante - Italian Takeaway Puerto del CarmenTakeaway Food Lanzarote.Delivery Available for Puerto del Carmen, Tias, Macher, Puerto CaleroFood Delivery Service - Lanzarote. Takeaway Lanzarote - Restaurants Puerto del Carmen Pizza Margherita - Tomate and Mozzarella Italia Ristorante - Italian Takeaway Puerto del CarmenTakeaway Food Lanzarote.Delivery Available for Puerto del Carmen, Tias, Macher, Puerto CaleroFood Delivery Service - Lanzarote. 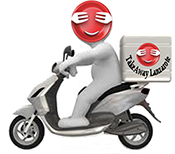 Takeaway Lanzarote - Restaurants Puerto del Carmen Tomato, mozzarella and ham Italia Ristorante - Italian Takeaway Puerto del CarmenTakeaway Food Lanzarote.Delivery Available for Puerto del Carmen, Tias, Macher, Puerto CaleroFood Delivery Service - Lanzarote. Takeaway Lanzarote - Restaurants Puerto del Carmen Grilles Vegetables, zucchini, peppers Side Orders - Italia Ristorante PizzeriaItalia Ristorante - Italian Takeaway Puerto del CarmenTakeaway Food Lanzarote.Delivery Available for Puerto del Carmen, Tias, Macher, Puerto CaleroFood Delivery Service - Lanzarote. Takeaway Lanzarote - Restaurants Puerto del Carmen Mixed Salad - Side Orders - Italia Ristorante PizzeriaItalia Ristorante - Italian Takeaway Puerto del CarmenTakeaway Food Lanzarote.Delivery Available for Puerto del Carmen, Tias, Macher, Puerto CaleroFood Delivery Service - Lanzarote. Takeaway Lanzarote - Restaurants Puerto del Carmen Side Orders - Italia Ristorante PizzeriaItalia Ristorante - Italian Takeaway Puerto del CarmenTakeaway Food Lanzarote.Delivery Available for Puerto del Carmen, Tias, Macher, Puerto CaleroFood Delivery Service - Lanzarote. Takeaway Lanzarote - Restaurants Puerto del Carmen Chips - Side Orders - Italia Ristorante PizzeriaItalia Ristorante - Italian Takeaway Puerto del CarmenTakeaway Food Lanzarote.Delivery Available for Puerto del Carmen, Tias, Macher, Puerto CaleroFood Delivery Service - Lanzarote. Takeaway Lanzarote - Restaurants Puerto del Carmen Toasted Bread, Olive Oil, Garlic Italia Ristorante - Italian Takeaway Puerto del CarmenTakeaway Food Lanzarote.Delivery Available for Puerto del Carmen, Tias, Macher, Puerto CaleroFood Delivery Service - Lanzarote.